The Long lens Blog The Long Lens blog. Photography with added snaps. : Don't photograph me! It was the worst abuse I have experienced. "You better not be taking a photograph of me. I'll come up there and smash your camera if you're taking a photograph of me. You can't take a photograph of me. It's illegal. I'll rip you're head off if you take a photograph of me." He went on (at the top of his voice). "Right, I'll come up there now and smash your f***ing camera. Don't you dare talk to me like that. I'm going to knock you're f***ing head off. Come on, I'll have you now." Admittedly, by the time this 50-year-old man told me not to talk to him like that I had called him a kn*bhead about six times, an idiot more than once and had invited him to come up and join me on the upper level of the precinct so we could discuss the matter further. The strange thing was, this wasn't a drunken smoker or heavy drinker at 11.30 at night. 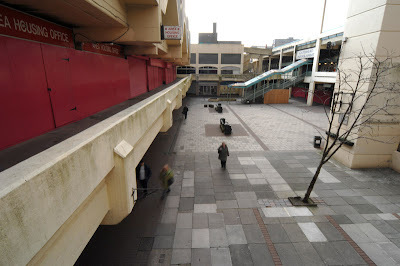 It was 11.30 in the morning in the drafty concrete courtyard at the back of Gateshead Indoor Market. I had been invited onto an organised trip to the top of Gateshead car park and was taking some pictures around the shopping centre beforehand. Both are scheduled for demolition within weeks. My camera, on a tripod, was pointing across the square, taking in both upper and lower levels (through a Sigma 12-24mm wideangle lens, if you're interested). The occasional shopper on the open-air lower level wandered into frame, but were nothing more than specks in the frame. As was Mr Furiously Angry, the man who walks around Gateshead giving Geordies a bad name. Thank god we don't get any tourists here. In my defence, and I should stress that angry responses should be treated with good manners to reduce the chance of escalting violence, my first words to this man were 'you don't have to be so rude'. I was genuinely shocked at this man's reaction to my camera. I was genuinely shocked at this man's attitude. And his vitriol. When he dropped his bag to the floor and gestured that he was about to run towards the stairs I thought I might have a situation on my hands. But I just could not stop myself calling him a kn*bhead. Quite frankly, he was. Of the highest order. If someone doesn't want their photo taken, that's fine by me. But I don't think anyone deserves to be spoken to like that. I wouldn't do it myself, I won't accept it to myself. * And if you're wondering, Mr Furiously Angry is the tiny body who is furthest away in the photograph above.